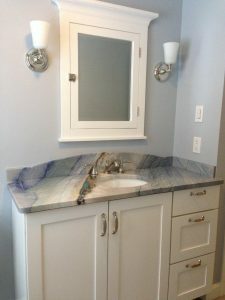 Whether you’re remodeling a kitchen, building one from scratch or just ready to give yours a face-lift, countertops are a central part of the look. 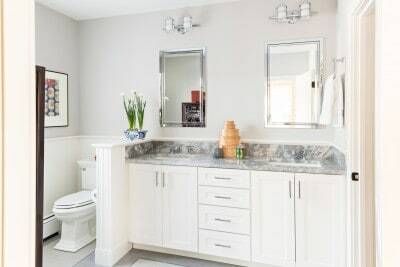 And you may be daunted by the wealth of options on the market; countertop surfaces range from well-known butcher block to less common materials such as glass and terrazzo. We’ve chosen 11 of the most popular to get you started. Read on to find the one that’s right for you. Pros: Granite’s beautiful mottling and the host of colors and patterns found in nature make each piece one of a kind. It stands up well to splashes, knife nicks, heat and other wear and tear. Made primarily from acrylic and polyester, solid surfacing first was sold under the brand name Corian, which is often (erroneously) used as a generic term for it. Today, it’s made by a host of manufacturers and has enjoyed steady popularity over the years. Pros: Because solid surfacing is nonporous, it’s virtually maintenance free — no sealing or special cleaning required. Although it can be susceptible to scratches and burns, those are easy to sand out. Color and pattern options are extensive, and because you’re not trying for the look of a natural material, you can experiment with vibrant hues such as turquoise or tomato red. Seamless installation means there are no cracks to trap dirt and debris. Cons: Solid surfacing can have a patently artificial look and feel, yet can approach the price of natural stone. As mentioned above, it doesn’t stand up to hot pans or sharp knives as well as other materials. Pros: Quartz surfacing has the same advantages as solid surfacing with regard to maintenance. As an engineered product, it’s available in a far greater range of colors and patterns than natural stone. Is there anything that looks and feels more glamorous than a marble countertop? Peerless in terms of its luminescence and distinctive veining, it’s an ultra-traditional choice. Cons: Marble is very susceptible to stains, even with sealing. For that reason, it’s not often used throughout an entire kitchen — most homeowners limit it to one or two small areas. It can also scratch and chip. Pros: It holds its own against heat and sharp blades, and resists stains. If one or two tiles chip or crack, they’re fairly easy to replace. Cons: Tile’s uneven surface can make it difficult to balance a cutting board or roll out a pie crust. Unsealed grout is prone to staining; standing moisture can damage it and contribute to bacterial growth. Pros: Laminate is one of the most affordable countertop materials, so it’s a good choice if your budget is tight. It’s low maintenance and easy to clean. Its light weight doesn’t require the support of a thick cabinet base. Cons: Laminate is prone to scratching, burns and, in some cases, staining. With wear and moisture exposure, the layers can peel. Because of the raw particle board core, you can’t use laminate with undermount sinks, and it’s also difficult to repair if it gets damaged. 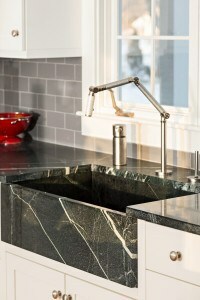 Although it’s in no danger of overtaking granite, soapstone has come into its own as a countertop material. It offers subtle, nuanced beauty yet feels humbler than granite or marble. Cons: Soapstone needs polishing with oil to keep it in top shape. It can crack over time, and it can’t handle knife scratches and nicks as well as some other types of stone. The natural roughness of its surface can scuff glassware and china. Once found mostly in commercial kitchens, stainless steel has slipped into vogue within the past two decades. These countertops are custom made to fit your kitchen, so you’re guaranteed a tailored look. Pros: There’s a reason stainless steel is used in restaurants and other high-traffic kitchens: It’s nearly indestructible, and it resists heat and bacteria. It also provides a very distinctive look that feels appropriate in contemporary and industrial-style kitchens. Pros: Concrete is extremely versatile: It can be cast in any shape and custom tinted any shade you wish. You easily can add unique inlays, such as glass fragments, rocks and shells. Concrete stands up well to heavy use, although it isn’t as heat resistant as some other surfaces. Cons: Because it’s porous, concrete will stain without frequent sealing. With time and settling, small cracks can develop. Concrete is extremely heavy and will need strong support beneath. Like stainless steel, its custom creation ups the price tag. Butcher block has a classic appeal and always looks fresh. It’s especially fitting for traditional, country and cottage-style kitchens. 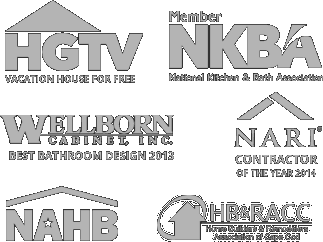 Pros: Many homeowners like butcher block’s warm, natural appearance and variegated wood tones. Although knives scratch it, many people like the shopworn look it develops — after all, it’s what chopping blocks have been made of for years. But you can also sand scratches down with ease. Paper countertops? You read it right. Created from paper fibers mixed with resin, this surface is ecofriendly and a whole lot more durable than it sounds. 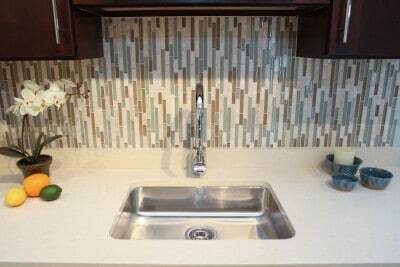 Pros: Paper composite evokes the look of solid surfacing or laminate but with a warmer sensibility. It’s surprisingly hardy and can withstand heat and water admirably. It’s also a great deal lighter than natural stone or concrete. Cons: The material isn’t scratch proof and is susceptible to chemical damage. It needs an occasional rubdown with mineral oil, and even sanding, to refresh it. Although it sounds as though it would be a lower-budget option, it isn’t (unless you install it yourself).